First African American Member of the House of Representative from Indiana (1982). This pioneer completed the term of Adam Benjamin, who died in 1982, and was elected to her own term. (1982 - 1985). She later served as City Clerk of Gary, Indiana (1985 - 1993). 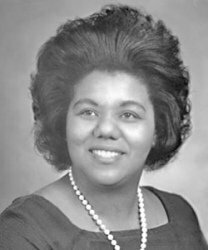 Prior to serving in Congress, she served in the Indiana House (1974-1976) and Senate (1976-1982)..